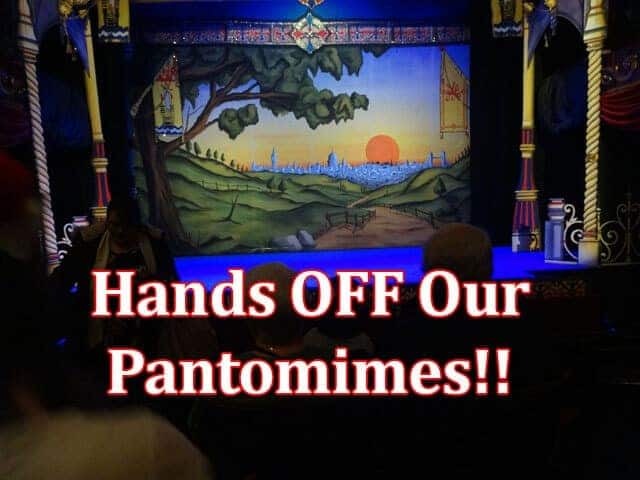 Hands off our pantos you PC nazis. I feel compelled to write this after recent drama in the press regarding several of this year's pantomimes. As a professional comedian and panto performer, I am increasingly saddened by the politically correct brigade and worse, the spineless people in control of theatres acting on every whinge they hear. You can be 100% sure that the people complaining are a minority and they are attempting to ruin a 200-year-old tradition that is meant to and does, entertain the whole family. Let us first of all look at the term "Family show" does this not mean for all the family? Are Mums, Dads, Aunts, Uncles and grandparents not part of the family? Do we see the word "Children'show" advertised on a panto poster? I think not! The whole point of pantos is that they entertain the whole family. The kids get all the audience participation, the bright colours and the fun. To stop the adults being bored out of their minds for two hours there is the double entendre. Now before you start whining your kids understand the double entendre this does not qualify as a complaint against the scriptwriters, you may want to look closer to home there at why your kids understand the subtleties of jokes that are aimed at adults. Perhaps your kids are watching videos and comedy that they should not be on the internet? I am not advocating that pantos should be smutty, the jokes should definitely be able to be taken in two ways eg in Cinderella Dandini when asked to organise the ball might say "The prince always forgets to tell me which day he wants me to hold his balls"
This should be beyond the understanding of most children. If your kids understand both sides of that here's the thing it is too late for you to shield their innocence. The PC brigade does not see that they are restricting the choice of others. DO NOT patronise me by telling me what is right or wrong for my kids that is my decision as a parent. If you do not think a panto is suitable for your child DON'T GO!!!! If you choose to take them and they repeat something they picked up on that they should not have, here is a chance to be a parent and educate your child in social niceties, not an opportunity to ruin the panto next year for 20,000 other people who did enjoy it with your whining. In general, I find this constant mollycoddling of the public in this country disturbing. Three people complain about something and it is major news, then things get changed with no input from the 20,000 audience members that loved the show and were totally entertained. Panto producers BE WARNED, after a few years of being bored to tears with PC pantos adults will stop buying tickets, no adults will mean no kids either. Where the hell did common sense go? Why aren't the majority being listened to? Yes, you have the right to be offended, but here is the thing, being offended does NOT make you right! These whining individuals make me both sad and mad, OH YES THEY DO! Stop it you oppressive parenting snowflakes! Please for all our sakes GET A HOBBY!